Just after midnight on Sunday, 31 August 1997, a Mercedes carrying a beloved British princess, her companion, a bodyguard and a driver, crashed in a tunnel along the Seine River at the Pont de l’Alma bridge in Paris. Dodi Fayed, the princess’ companion, died outright as did the chauffeur but the bodyguard survived with serious injuries. The princess died of her injuries after being taken to hospital and her death was later announced to a stunned world. Her name was Diana, Princess of Wales. Diana Frances (née Spencer) was born on 1 July 1961, in Park House, Sandringham, Norfolk. She was the youngest daughter and the fourth of five children—Sarah, Jane and Charles—of John Spencer, Viscount Althorp and his first wife, Frances Ruth Burke Roche (later known as the Honourable Frances Shand Kydd). 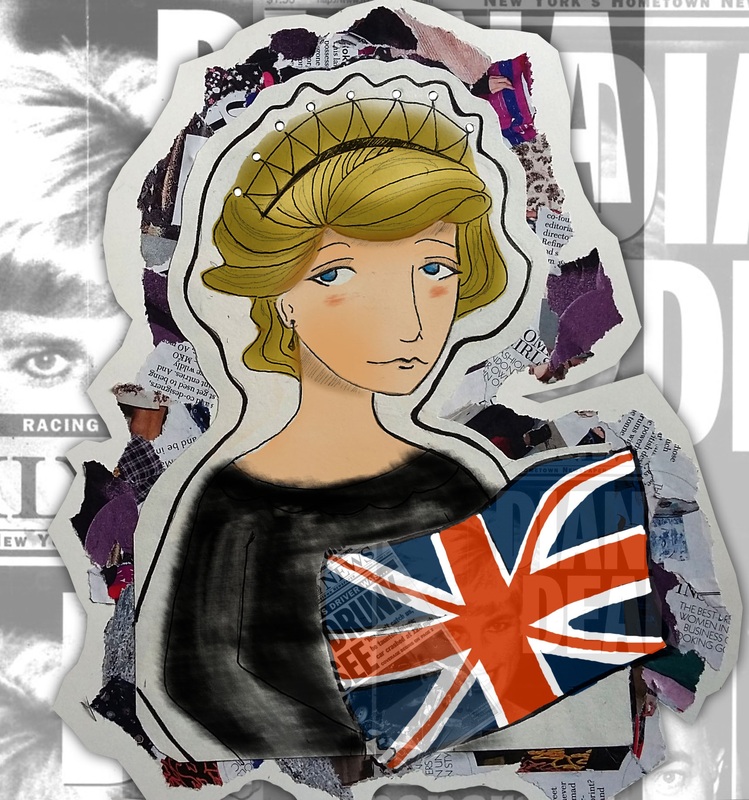 Diana became Lady Diana Spencer after her father inherited the title of Earl Spencer in 1975. The Spencer family were one of Britain’s preeminent aristocratic families with Royal ancestry. Both of Diana’s grandmothers had served as ladies-in-waiting to Elizabeth, the Queen Mother. The Royal family frequently holidayed at the neighbouring Sandringham House, and Diana played with Princes Andrew and Edward as a child. Diana had a chaotic and isolating childhood. Her parents did not have a happy marriage, and in 1967, her mother left her father to live with Peter Shand Kydd. The subsequent divorce in 1969 had a traumatic effect upon her. Diana later said of her own marriage, “I think like any marriage, especially when you’ve had divorced parents like myself; you want to try even harder to make it work“(www.verybestquotes.com). Diana was educated at Silifield Private School in Gayton, Norfolk and at nine years of age, she attended Riddlesworth Hall School, an all-girls boarding school near Diss. In 1973, she joined her sisters at West Heath Girls School in Sevenoaks, Kent. Diana failed her O levels twice but showed a talent in music and excelled in swimming and diving. She also loved dancing. He subsequently moved the entire family to Althorp, the Spencer seat in Northampton. After briefly attending the Swiss finishing school, Institut Alpin Videmanette, Diana returned to London where she shared her mother’s flat with two school friends. She took a cookery course and a series of low-paid jobs including working as a nursery teacher’s assistant at the Young England School in Pimlico. In July 1979, her mother bought her a flat for her 18th birthday. Diana lived at Coleherne Court in Earls Court with three flatmates until 25 February 1981. In November 1977, Diana was reacquainted with Prince Charles who was thirteen-years her senior and seeing her sister at the time. But it wasn’t until the summer of 1980, that the Prince began to take a serious interest in her as a prospective bride while they were guests at a country weekend, where she watched him play polo. The Prince would later describe the teenager as a “jolly, amusing and attractive 16-year-old … bouncy and full of life” (www.moneyweek.com). He invited Diana for a sailing weekend in Cowes aboard the royal yacht, Britannia, followed by an invitation to Balmoral to meet his family. She later refered to the weekend as ‘lovely’ (www.royalty.wikia.com). Diana was a shy teenager when Prince Charles was reacquainted with her but she was to become one of the most well-recognised and influential style icons in the world. From the moment she emerged into the public realm, Diana made a big impression on the general public and around the world. She was tall and pretty, with ash blonde hair and striking blue eyes. In the years to come she would evolve into a luminously beautiful and poised young woman. The young Lady Diana was well-received by the Royal family, and after six months of courtship, Prince Charles proposed to her on 6 February 1981. “He said, ‘Will you marry me?’ and I laughed. I remember thinking, ‘This is a joke,’ and I said, ‘Yeah, okay,’ and laughed. He was deadly serious. He said, ‘You do realise that one day you will be queen.’ And a voice said to me inside, ‘You won’t be queen, but you’ll have a tough role.’ So I said, ‘Yes.’ I said, ‘I love you so much, I love you so much.’ He said, ‘Whatever love means.’” Diana recalled (www.worldhistoryproject.org). On 26 February 1981, the couple publicly announced their engagement to the world with Diana showing off her engagement ring—a 12-carat Ceylon sapphire—surrounded by 14 diamonds. Diana quit her job at the nursery and began living at Clarence House for a brief period before moving to Buckingham Palace in the lead-up to her wedding. Her first public appearance with her future husband was in March 1981 at a charity ball at Goldsmiths’ Hall, where she met her friend and confidante Princess Grace of Monaco. It was apparent from day one that Diana was something special. She endeared herself to the world and it was clear that she was unlike anybody else. “I don’t go by the rule book, I lead from the heart, not the head” she was to say (www.biographyonline.net). Diana was dressed in an ivory taffeta and antique lace gown with an opulent 25ft train. The Victorian-style dress was hand-embroidered with over 10,000 mother-of-pearl sequins and pearls. It was designed by husband and wife team, David and Elizabeth Emanuel, and was valued at £9,000 at the time. Diana chose to wear the Spencer family heirloom tiara, instead of Queen Mary’s Lover’s Knot Tiara for the wedding. Prince Charles was dressed in the full-dress uniform of a naval commander. The ceremony was officiated by Archbishop of Canterbury, Dr Robert Runcie, who was assisted by clergymen from many denominations. At the altar, Diana’s nerves got the better of her when she reversed the order of Charles’s first two names, calling him Philip Charles Arthur George, rather than Charles Philip. Music used during the wedding included the ‘Prince of Denmark’s March’, ‘I Vow to Thee, My Country’ and Elgar’s ‘Pomp and Circumstance No.4’. New Zealand born soprano Kiri Te Kanawa sang ‘Let the Bright Seraphim’ from the oratorio Samson by George Frideric Handel. The ceremony was described as “the stuff of which fairy tales is made” by the Archbishop of Canterbury (www.worldhistoryproject.org). While married, Diana would bear the titles Princess of Wales, Duchess of Cornwall, Duchess of Rothesay, Countess of Chester, and Baroness of Renfrew. After becoming Princess of Wales, Diana automatically acquired rank as the third-highest female in the United Kingdom Order of Precedence (after the Queen and the Queen Mother), and was fifth or sixth in the orders of precedence of her other realms following the Queen, the relevant viceroy, the Duke of Edinburgh and the Prince of Wales. The newlywed couple took the open-topped state landau to Bukingham Palace where they emerged on the balcony at 1.10p.m. to give the crowds a long-awaited kiss. They retired from the public gaze to enjoy a wedding breakfast with 120 guests. Prince Andrew and Edward attached a ‘just married’ sign to the newlywed’s open-topped landau. They spent their honeymoon at the Mountbatten family home at Broadlands, Hampshire, on a 12-day cruise through the Mediterranean and at the Queen’s Balmoral Estate in Scotland. The new Princess of Wales immediately began making public appearances and undertook royal duties on behalf of the Queen, representing her at functions overseas. One of her first official visits was to the funeral of her friend and confidante Princess Grace of Monaco on Saturday, 18 September 1982. On the 5 November 1981, Diana’s first pregnancy was officially announced. It later transpired that Diana had thrown herself down a staircase at Sandringham in January 1982, 12 weeks into her pregnancy. She only suffered severe bruising but it was the first sign that all was not well with her. William Arthur Philip Louis was born in the private Lindo Wing of St Mary’s Hospital in Paddington, London, on 21 June 1982. A second son, Henry Charles Albert David, was born on 15 September 1984. She would break with Royal protocol in bringing up her sons. Diana chose her sons first names, dismissed the Royal nanny and hired her own, selected her son’s schools and clothing and even took them to school herself. “I live for my sons, I would be lost without them”, Diana would later say (www.womenshistory.about.com). Initially, Diana was overwhelmed by her public engagements and the intense media coverage of nearly every facet of her life, “I am finding it very difficult to cope with the pressures of being Princess of Wales, but I am learning to cope with it”, she confided in the then-Premier of Newfoundland, Brian Peckford, in 1983 (www.wikipedia.org). Gradually she began to develop and pursue her own interests. From the mid-80s, Diana became increasingly associated with specific charities. She had a very personal touch and was at ease with people from any background. “I love to hold people’s hands when I visit hospitals, even though they are shocked because they haven’t experienced anything like it before, but to me it is a normal thing to do” she said (www.likesuccess.com). Diana was one of the first high profile people to reach out to those living with AIDS. She had a significant impact in changing people’s attitudes towards those suffering with the disease, “HIV does not make people dangerous to know. You can shake their hands and give them hug—heaven knows they need it”, she said (www.ibtimes.co.uk). Diana’s support for charities and her humanitarian endeavours were widespread. She lent her name to the battle to ban landmines and was instrumental in encouraging Britain and other countries to support the Ottawa Treaty, which sought to introduce a ban on the use of anti-personnel landmines. Her work would leave a lasting mark, “I want to walk into a room, be it a hospital for the dying or a hospital for the sick children, and feel that I am needed. I want to do, not just to be”, Diana said (www.womenshistory.about.com). Diana had a sincere spiritual side which she explored: “I’m aware that people I have loved and have died and are in the spirit world looking after me” she once remarked (www.searchquotes.com). Diana’s weight dropped to thirty pounds after the birth of her first child and it later emerged that she had been struggling with bulimia. Early in their marriage, Diana and Charles were seen to be affectionate in public but by 1986 it was obvious that something was wrong. By the early 1990s, the couple would already be living separate lives. Later Diana would claim Charles had resumed his old, premarital affair with Camilla Parker-Bowles as early as 1984. In 1992, Andrew Morton’s biography of Diana titled Diana: Her True Story detailed the story of Charles’ long affair with Camilla Parker-Bowles, and alleged that Diana had made suicide attempts and suffered from depression. Salacious stories of infidelity on both sides emerged in the popular media which damaged Diana’s image. By December, with the consent of the Queen and consultation with government officials, Charles and Diana agreed to a legal separation. On 29 June 1994, Charles gave a televised interview with Jonathan Dimbleby, in which he confirmed his extramarital affair with Camilla Parker-Bowles saying he had rekindled their liaison in 1986, only after his marriage to Diana had “irretrievably broken down” (www.wikipedia.org). Diana gave her own BBC interview with Martin Bashir for current affairs series Panorama. It aired on November 20, 1995, and at last blew the lid on the dysfunctional Royal marriage. Diana used the interview to address the tensions in her marriage and her battle with bulimia and depression. She admitted to being unfaithful, and referring to her husband’s long-time affair with Camilla Parker-Bowles, she said: “There were three of us in this marriage, so it was a bit crowded.” (www.time.com). Diana let a few other facts slip which did not paint Charles and the Royal family in the most favourable light. Although she acknowledged that she would never be Queen, Diana expressed her hopes for the future: “I’d like to be a queen of people’s hearts.” (www.likesuccess.com). The interview was seen as a coup for Diana, she had misgivings about it almost immediately. “I think by the time of the broadcast, she deeply regretted it, not least because it did nothing to advance her cause” said Patrick Jephson, her former private secretary (www.telegraph.co.uk). He told the Mail on Sunday: “I think the scales fell from her eyes and suddenly what had been rather a subversive or daring scheme—or however they [the BBC] had dressed it up for her—it suddenly in the cold light of day didn’t look like such a good idea” (www.dailymail.co.uk). On 15 July 1996, the divorce was finalised in the High Court. Diana signed the oppressive divorce papers with some reluctance. She was no longer to be addressed Your Royal Highness, and had to formally curtsey to Charles and even her two boys. Prince William was reported to have reassured his mother: “Don’t worry, Mummy, I will give it back to you one day when I am King” (www.wikipedia.com). Diana was allowed to keep and use the title ‘Princess of Wales’. Diana was not allowed to represent the country abroad and nor could she receive public money for her work anymore. She was given a £17.5 million settlement as well as £400,000 per year. Diana was allowed to retain three Orders and to live at Kensington Palace until William and Harry came of age. Custody of both boys were shared by Diana and Charles. The decree of the divorce was given at 10.27 a.m. on 28 August 1996. Diana confided in a friend that it was the saddest day of her life. Diana had given up all but a small nucleus of her charity work but remained a prominent figure as she travelled abroad. In June, 1997, Diana auctioned off 79 dresses and ball gowns, raising £3.5 million for charity. It was the beginning of a new chapter for Diana and also a symbolic break with her past. The Princess had been seeing a British-Pakistani heart surgeon named Hasnet Khan and visited Lahore in May 1996 upon invitation of Imran Khan. Khan was related to Hasnet, and Diana visited his family in secret. The relationship was conducted in secret and lasted almost two years. “I think I’ve met my Mr. Wonderful,” Diana told Simone Simmons, her energy healer (www.vanityfair.com). Those closest to Diana describe Hasnat Khan as “the love of her life” (www.wikipedia.com). “Hasnat was a decent, intensely private man from a traditional, conservative Pakistani family, and he was worried about how it would work,” Jemima Khan told Vanity Fair. “And he hated the thought of being in the glare of publicity for the rest of his life.” (www.vanityfair.com). Within a month Khan’s and Spencer’s relationship ending, Diana began seeing Dodi Fayed, son of Egyptian billionaire Mohamed Al-Fayed, and holidayed with his family in the south of France. She and her two sons were entertained on the Jonkal; a multimillion-pound yacht. Rosa Monckton was one of Diana’s closest friends and she believes strongly that the relationship with Dodi was designed to make Hasnat jealous. On July 22, Diana flew to Milan to attend the funeral of the murdered fashion designer Gianni Versace, and then she seemed to be travelling almost non-stop. Shortly after midnight on 31 August 1997, Diana was involved in a high-speed car chase through the Alma Tunnel, on the right bank of the Seine under the Place de l’Alma which ended tragically at 12.25 a.m. She was fatally injured. The horrific accident claimed the lives of Dodi Fayed and the driver Henri Paul. Her bodyguard, Trevor Reece-Jones, was badly injured but alive. The Mercedes had been travelling at 80mph through the narrow tunnel, when the driver apparently lost control of the wheel, slamming into a concrete support and bouncing into a wall. “The car was being chased by photographers on motorcycles, which could have caused the accident”, a spokesman for the Prefecture of Police said (www.nytimes.com). An American witness, Mike Walker, told CNN the car in which Diana was travelling “looked like it hit the wall” (www.cnn.com). Diana, Princess of Wales, died at 4 a.m. on 31 August 1997 after going into cardiac arrest, at Paris’ Pitié-Salpêtrière Hospital. She was 36-years-old. The death was announced at 6 a.m. by Dr Alain Pavie, head of the cardiology department. An 18-month French judicial investigation found that the crash was caused by Henri Paul, who lost control of the car at high speed while drunk. Anti-depressants and traces of a tranquillising anti-psychotic were in his body. Conspiracy theories began almost immediately after Diana’s death was made public. Mohamed Al-Fayed later contended that the crash was orchestrated by MI6 on the instructions of the Royal Family. Both Lady Annabel Goldsmith and Rosa Monckton spoke publicly at the inquest in 2008. Monckton stated that Diana had been in love with Hasnet Khan and that her relationship with Dodi had not been serious. On 7 April 2008, the jury concluded that Diana and Dodi were the victims of an “unlawful killing” by the “grossly negligent” chauffeur Henri Paul and the drivers of the vehicles following them. Additional factors were “the impairment of the judgement of the driver of the Mercedes through alcohol” and “the death of the deceased was caused or contributed to by the fact that the deceased was not wearing a seat belt, the fact that the Mercedes struck the pillar in the Alma Tunnel rather than colliding with something else”. Diana’s death was met with extraordinary public expressions of grief after an unprecedented week of mourning. Four books of condolence were opened at St. James’s Palace for mourners to pay tribute to her. Diana’s funeral was held at Westminster Abbey on Saturday, 6 September 1997, and drew an estimated 3 million mourners and onlookers in London. 32.1 million Brits watched the funeral on television, making it one of the United Kingdom’s highest viewing figures ever. The funeral was aired in 200 countries in 44 languages and watched by 2.5 billion worldwide. Prince William and Prince Harry walked in the funeral procession behind Diana’s coffin, along with the Prince of Wales, the Duke of Edinburgh, Diana’s brother Lord Spencer, and representatives of some of her charities. Both Diana’s sisters read tributes to her at the funeral service and Elton John played his re-worked version of ‘Candle in the Wind’, ‘Goodbye England’s Rose’. Lord Spencer made a funeral address in which he described Diana as the “very essence of compassion, of duty, of style, of beauty” (www.bbc.co.uk) He also used the speech to strongly criticise the media and to condemn the Royal family, saying Diana “needed no royal title to generate her particular brand of magic” (www.dailymail.co.uk) Protocol was disregarded when the guests applauded his speech. After the ceremony, the coffin was driven to Althorp in a Daimler hearse. Mourners cast flowers at the funeral procession for almost the entire length of its journey and vehicles even stopped on the opposite carriageway of the M1 motorway as the cars passed. Diana was buried in a private ceremony—only Prince Charles, Princes William and Harry, Diana’s siblings, her mother, Diana’s best friend and a clergyman were present. Diana was interred on an island in the middle of a lake within the grounds of Althorp Park. In her coffin, she wore a black Catherine Walker dress and clutched the rosary beads given to her by Mother Teresa of Calcutta. Princess Diana has left an indelible mark on the hearts and in the minds of millions throughout the world. She grew from shy, awkward teenager to become a global icon and one of the most adored members of the Royal family. Diana is one of the most important British people of recent memory and her incredible influence cannot be denied. She personified compassion. Yet Diana was all too human in the end. “The public… they wanted a fairy princess to come and touch them, and everything will turn into gold and all their worries would be forgotten. Little did they realise that the individual was crucifying herself inside because she didn’t think she was good enough” (www.biographyonline.net). This entry was posted in People and tagged female role models, Princess Diana, royal family, royalty. Bookmark the permalink.